The IDTechEx! Show at the Santa Clara Convention Center in California USA on November 14 - 15 is the leading global event for product innovators and technology scouts, bringing together emerging technologies with global brands. The event features over 265 exhibitors, 3,500 attendees coming from over 50 countries and over 250 speakers across 8 concurrent conference tracks. Opening the event are four select Cornerstone presenters who will cover how technologies are solving key global problems, from healthcare to mobility. Opening the Cornerstone session is Professor Greg Whyte OBE. Professor Whyte is a former Olympian, world renowned sport scientist and Physical Activity Expert. He was appointed Officer of the Order of the British Empire (OBE) for his services to sport, sport science and charity. Professor Whyte will cover how wearable technologies including sensors, IoT and AI based data analytics helps people achieve more. Case studies will include work with pre-chemotherapy patients, improving their health and fitness before treatment, to working with global stars including David Walliams. Following this will be the $10 Billion people movement company, KONE. Speaker Jeffrey Blum, Senior VP, will present on "Improving the flow of Urban Life: Smart Elevators and Escalators are Here." This includes their use of sensors and IoT connectivity to enhance mobility, from intuitive user interfaces to predictive monitoring. The third Cornerstone speaker is from the $22 Billion electronic manufacturing services company Jabil. Jabil manufactures everything from consumer packaging, mobile devices and intelligent clothing to appliances, automotive, aviation and energy solutions for their customers. Consumers and organizations increasingly desire customization and personalization of products and services in addition to having increasing expectations of the speed of delivery of such products. Speaker Girish Wable, Manager Strategic Capabilities, will cover case studies about how technologies including 3D Printing, printed electronics, sensors and IOT are addressing this need, from mass customization to the digital supply chain. Covering the trend and opportunities of the increasing electrification of vehicles will be Micheal Austin of BYD Motors. Headquartered in China, BYD Motors is one of the fastest growing vehicle companies in the world. Micheal Austin, a battery expert of over 25 years, has worked as BYD US operations' VP for 13 years and will discuss BYD's "Zero Emissions Energy Ecosystems," covering the trends and opportunities of the increasing electrification of all classes of terrestrial vehicles globally. This presentation will cover progress with affordable solar power, reliable-environmentally-friendly energy storage and cutting-edge electrified transportation. A further 250 speakers will be presenting at the event from global brands to technology suppliers with innovative solutions. Over 3,500 attendees are expected. For full details of the IDTechEx Show! 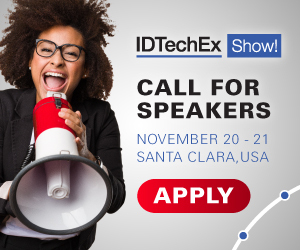 held on November 14 - 15 2018 in Santa Clara, see www.IDTechEx.com/usa.